The coldest part of the year is here, and the kids are restless! Boulder is known for its amazing outdoor activities for families in the warmer seasons, but it also offers some great indoor activities that families can enjoy when the air is too cold for comfort. The University of Colorado’s Museum of Natural History earned the #1 spot by being fun, educational, interactive AND parent-friendly! The museum offers kid-inspired exhibits (right now — TreeSpace) and a cute gift shop on the main level. 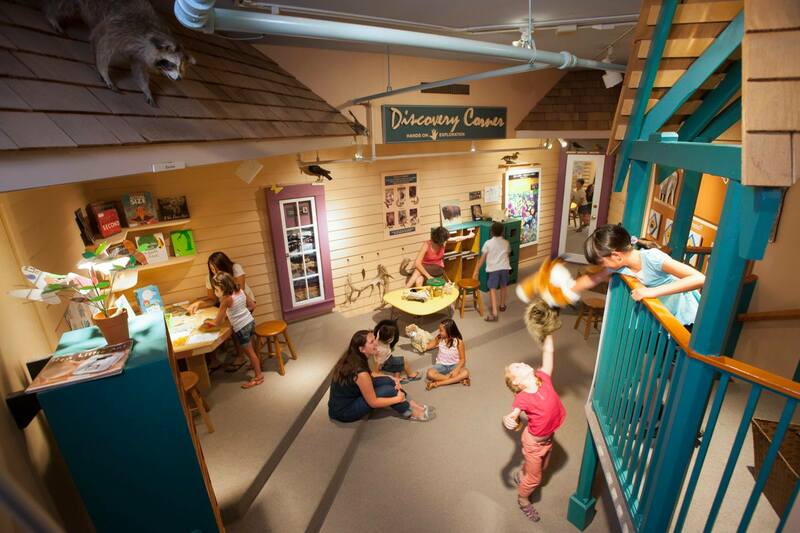 In the lower level, kids will have a great time in the interactive play and learning area, the Discovery Corner. Right outside the play area parents can enjoy a nice, FREE cup of coffee or tea in the museum’s BioLounge with comfortable seats and inviting atmosphere. Family-friendly bathrooms are located upstairs. While there are beautiful staircases in this beautiful, old building, there is also a centrally-located elevator making the museum handicapped and stroller-friendly. Admission is free, donations are accepted. The gift shop offers a fun array of science-inspired items. The UMC is right next door if you get a hankering for a Starbucks or somethings to eat. The museum is open Monday – Friday 9-5, Saturday 9-4 and Sunday 10-4. Paid parking is located South of the museum. Closed on University holidays. At Color Me Mine, kids and adults will have a blast painting their very own ceramic piece! The art space is warm and cozy, and even has a free tea & coffee station. Pick your ceramic piece (they have everything from mugs and plates to piggy banks and figurines), pick your paint and start creating. As an added bonus, painting at Color Me Mine means you don’t have to clean up — the staff will handle all that for you. In fact, once you are done painting, your piece will be glazed and fired for you, all you have to do is pick it up a week later. Color Me Mine is open Monday – Thursday 11 AM – 8 PM and Friday – Sunday 10 AM – 8 PM. Studio fees are $10/adults, $6/kids plus the cost of your ceramic item. Boulder has three recreation centers located in different parts of the city, and each has its own unique amenities. Each of the rec centers have a pool, but the North Boulder Rec Center and East Boulder Rec Center have kid-friendly features like water slides and warmer water temperatures. To find out more about each of these rec centers, click here. The Museum of Boulder is another fun, family friendly option for a cold day in Boulder. The museum has multiple exhibits, including a Boulder Experience gallery, a travelling exhibit (currently Living with Wolves and Dinosaurs: Land of Fire and Ice), and art exhibits. The museum also features the Google Garage: and interactive area with activities that will inspire creativity and curiosity. The museum is open Weekdays 9 AM – 5 PM (Closed on Tuesdays), and Weekends from 10 AM – 5 PM. Admission is $10/adults, $8/seniors & youth, Kids under 2 are FREE. Just a short drive out of Boulder, Play Time in Lafayette is the perfect spot for littles (0 – 5 years old) to get the wiggles out on a frigid day. Located in the Sports Performance Center, kids can build, climb, run, jump and be creative on the field while parents take a break. Open Mondays and Wednesdays 9 AM – 12 AM from October – April. Admission $8/Kids 1-5, $6/Siblings, $3/Kids 8 Months – 1 year, Under 8 Months FREE. Parents are and gaurdians are always free. Head up the hills to nearby Nederland to visit the Carousel of Happiness, a magical menagerie featuring 56 whimsical, hand-carved animals on a restored 1910 Looff carousel! Fun for all ages, this lovely carousel turns to the music of a 1913 Wurlitzer band organ. Witness the 100-year old gears churn by watching from the upper observation window. The carousel is open Thursday – Monday from 11 AM – 6 PM. Wheelchair ramp available. Rides are just $1! A perfect escape for kids on a cold day, the Paul Derda Rec Center in Broomfield offers an indoor play space for kids from 0 – 7 years old. The space includes a toddler/crawler area, large play structure with slide and sitting area for parents. Drop-in rates Resident/NonResident: $5/$7.75 Adults, $3.50/6.25 Kids 4+, Kids under 4 are FREE. The Longmont Museum and Cultural Center is a community and cultural hub for the city, featuring changing exhibits in history, art and science. The long-term exhibit, Front Range Rising, is an award-winning look at the history and culture of this region from 14,000 years ago to today. The museum also The Museum holds regular hands-on education programs for all ages, as well as events like indoor and outdoor concerts and performances, film series and lectures. The museum is open Monday – Saturday from 9 AM – 5 PM and Sunday from 1 PM – 5 PM.